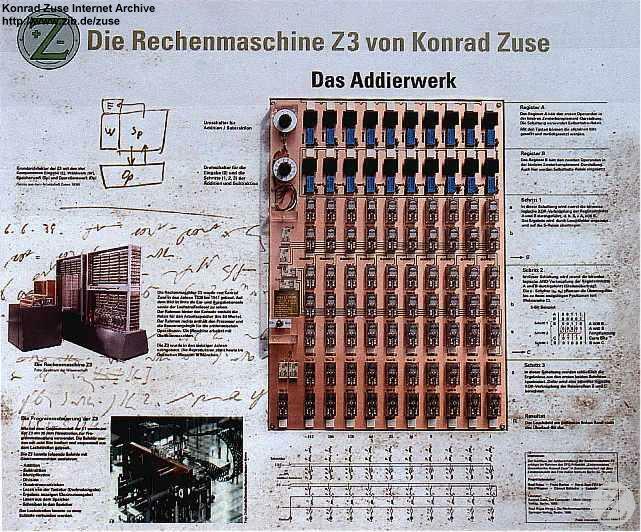 The project of reconstructing Konrad Zuse's calculating machine Z3 was initiated by Prof. Dr. Raúl Rojas (FU Berlin) and Dr. Horst Zuse (TU Berlin). Prof. Dr. Raúl Rojas was the technical leader and was in charge of the construction of the memory and the processor for which he defined the block architecture. As foundation for this served the patent application of the Z391 of Konrad Zuse. (published in: R. Rojas (ed. ), Die Rechenmaschinen von Konrad Zuse, Springer-Verlag, Berlin, 1998). On the basis of the block architecture Dr. Frank Darius (FU Berlin) conceptualized the concrete circuits with modern relays. The circuits were reviewed and adjusted to the existing hardware by Georg Heyne (head of the electronic laboratory of Fritz-Haber-Institute, Max-Planck-Gesellschaft). 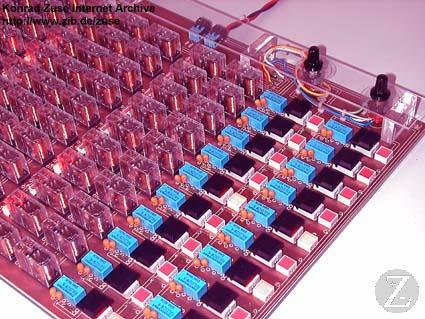 Wolfram Däumel (Fritz-Haber-Institute) designed the layout of the boards and Lothar Schönbein and Torsten Vetter (Fritz-Haber-Institute) did the microprogramming and assembly. 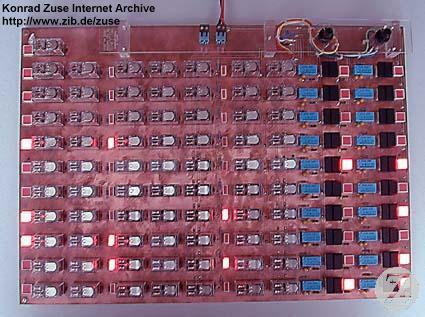 With support of Bernhard Frötschl (FU Berlin) and Prof. Rojas Cüneyt Göktekin (FU Berlin) created a user interface to control the Z3 via PC instead of the Z3-console. In addition to that Cüneyt Göktekin implemented this virtual console in the programming languages Java and C. The debugging of hard- and software was performed by Dr. Darius, Bernhard Frötschl, Cüneyt Göktekin and Prof. Rojas. With their teachers Thekla Lewandowki, Olaf Morgenbrod und Norbert Wagner pupils of the 1. Berufsschule Pankow welded the frames for the memory and the calculator unit. The pupils of the Konrad-Zuse-Schule in Hünfeld constructed together with their teacher Uwe Trautrims the punched tape reader and the punching machine. In this video the reconstruction of the Z3 is presented. It was shot on the 9.1.2002. On the left you can see the calculating unit and on the right the memory. The console of the Z3 with which the next executive operation and the operands were chosen was substituted with a PC in the replica. Like the original Z3 the reconstruction can perform the following operations: addition, subtraction, multiplication, division, square root and the conversion of decimal into binary digits and vice versa. 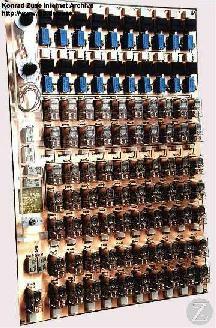 Above the calculating unit you can see the stepping switches which are responsible for the control of the operations. The memory stores 32 floating point digits per 22 bits (1 bit for the algebraic sign, 7 for the exponent and 14 for the mantissa). 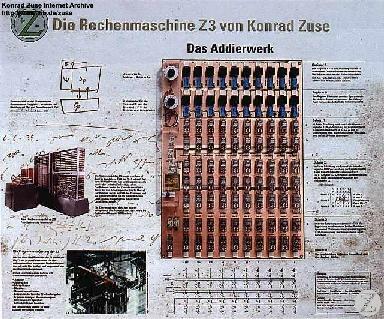 The mantissa addition circuit of the Z3 was built on a DIN A3 sized board for exhibitions and lectures about Konrad Zuse. According to the original documents a 10-bit electromechanical circuit was developed. 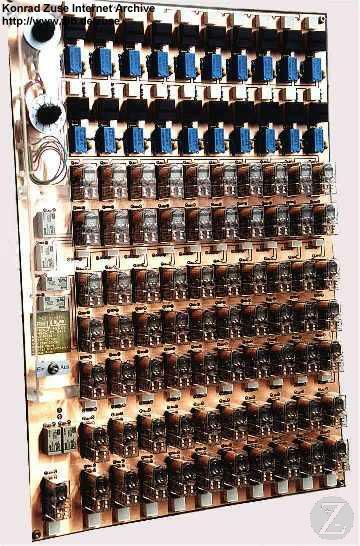 It consists of two manually settable registers to enter the summands - this was realized just as in the original using bistable relays - and of two XOR gates and a AND gate per bit for the calculation of the carry-over. The entered summands, all intermediate data of partial operations and the end result are displayed with LEDs. In the same manner as in the original machine each calculation was divided into three steps that can sequentially be triggered with a turning knob. A switch allows to choose between addition and subtraction. Acknowledgment: We like to thank the electronic laboratory of the Fritz-Haber-Institute (MPG) especially Georg Heyne, Wolfram Däumel and Viktor Platschkowski for their advices, the use of their layout software and the digital milling machine. View the photos of the reconstruction of the Z3 project.